Mahmoud al-Mabhouh, who according to Hamas was assassinated by Israel in Dubai was killed by electric shock after an electrical appliance was held to his head and had already escaped several past attempts to kill him, according to his brother. 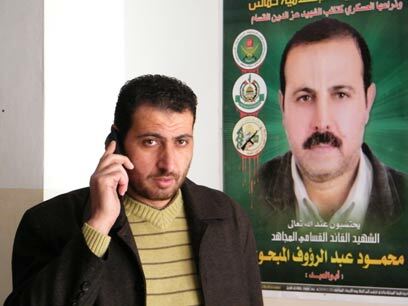 "The first results of a joint investigation by Hamas and the (United Arab) Emirates show he was killed by an electrical appliance that was held to his head," Faiq al-Mabhouh told AFP by telephone. Speaking to Ynet from Gaza, he further noted, "The assassination attempt was one of many. My brother escaped an attepted hit in Gaza, and six months ago he was poisoned and was unconscious for 36 hours, but he didn't like the media and no one in the organization spoke of it. "He also survived when Izz El-Deen Sheikh Khalil was assasinated in Damascus in 2004 after security cameras located a device attached to his car." Al-Mabhouh's family has no details on the circumstances of Mahmoud's death. Meanwhile, Hamas are blaming the Mossad. "Hamas' overseas branch officially informed the family 10 days ago that he was dead, but only tonight after all of the forensic examinations, his body was turned over to Hamas and and we were notified at two in the morning," Faiq said. The family set up a mourners' tent and Faiq said that all of Hamas' leadership arrived. "The family has no doubt it was a hit," he said. Al-Mabhouh renewed contact with his family in Gaza in the last years, however his brother said Mahmoud never spoke about his activities. "All we knew was that he supports the organization's resistance in the Strip and in Palestine." For months the Israel Defense Forces chased after al-Mabhouh until he left the Gaza Strip via Egypt and finally settled in Damascus, where he served as a senior official in Hamas' military wing. "You know him better than us. I can say he was one of the first in Hamas to start an armed battle against the occupation. He was one of the first founders of the Izz al-Din al-Qassam Brigades when he started operating with a small squad, a member of which is still in Israeli prison, and has since been wanted,"
He is referring to Muhammad Sharatha, commander of Hamas' 101 squad, which kidnapped and murdered soldiers Avi Sasportas and Ilan Sa'adon in 1989. Recently his name was mentioned in relation to the prisoner swap deal to secure the release of Gilad Shalit, however it appears Israel is against his release. Mahmoud al-Mabhouh had 13 siblings and was a father to four children. It appears the assassination has not changed the family's outlook. "This doesn’t end the resistance and damages nothing. At most it's a closure with my brother, since they assassinated Sheikh Ahmed Yassin, and Rantissi and the resistance kept on going." Al-Mabhouh's house was demolished in 1989. One of his neighbors told Ynet, "The IDF blew the house up, apparently trying to avoid damaging the house near by." He further noted, "We knew he was the one behind the killing of an Israeli soldier." Hamas' deputy politburo chief Moussa Abu Marzouk said Friday, "Mossad agents are those who assassinated al-Mabhouh in Dubai." The organization's military wing stated that al-Mabhouh was one of its founder and the man behind the kidnapping of Sa'adon and Sasportas. The news of al-Mabhouh's death did not comfort the families of Sa'adon and Sasportas, who were kidnapped by Hamas in the late 1980s. As in the past, members of the Sasportas family refused to comment on the issue, but thanked the defense establishment. "It's different this time. We support the security forces and the IDF and wish that all soldiers take care of themselves and not be harmed. We await Gilad Shalit's return home." Nearly 21 years after her son was abducted, Gilbert Sa'adon told Ynet that she was outraged to hear the news of al-Mabhouh's assassination. "All these years they told me they killed everyone involved in it. "I thought that's what happened to them and was certain they were no longer alive. Suddenly, this morning I heard the report. It's a shame they did it only now," she said. See all talkbacks "Brother of killed Hamas man says electrocuted to death"